Akvavit, like vodka, is distilled from either grain or potatoes. After distillation, it is flavored with herbs, spices, or fruit oil. Commonly seen flavors are caraway, cardamom, cumin, anise, fennel, and lemon or orange peel. Dill and grains of paradise are also used. 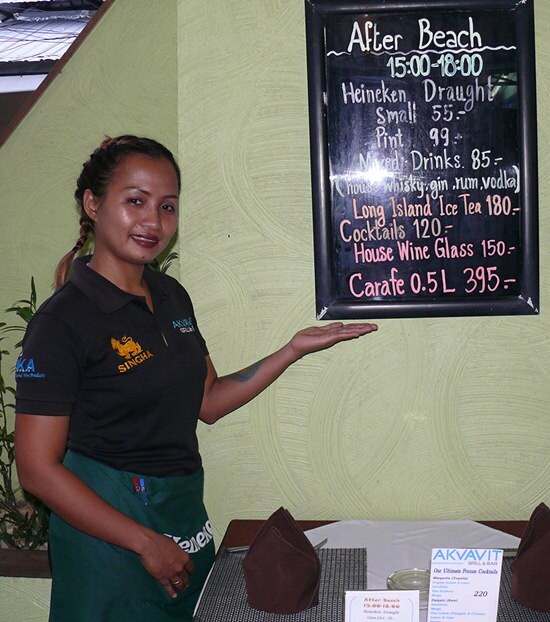 The above is one meaning for Akvavit, but in Jomtien there is another meaning – Akvavit Grill and Bar on the corner of Soi 3 Jomtien Beach Road. 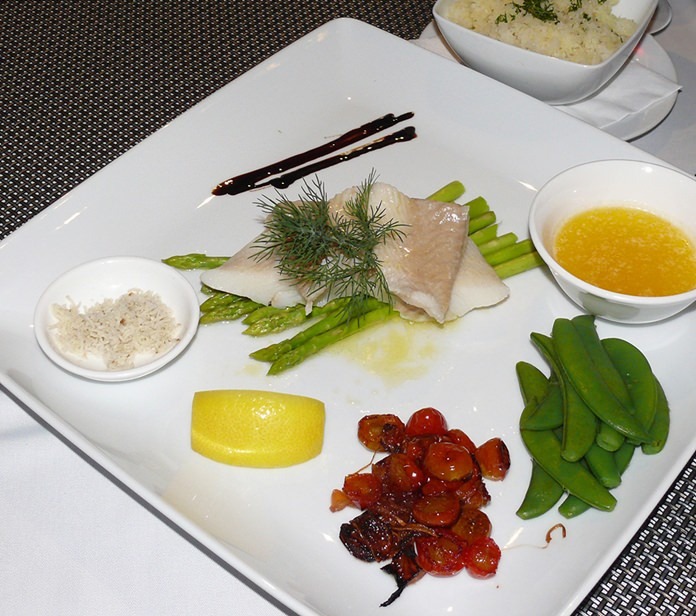 Our Akvavit is run by Pelle, who has developed a very interesting Scandinavian menu, plus European and Thai dishes. Akvavit has a streetside bar leading to a covered mezzanine floor and then to a glassed in air-conditioned section. The staff are outfitted in black and were very helpful. Pelle presents a rotating specials menu which begins with Creamy beef stroganoff made with Australian tenderloin boiled in cream, red wine, pepper and onion served with mashed potatoes and horseradish aioli. The specials menu is B. 295, a very reasonable price. From the menu as starters he presents Pepper Marinated Salmon Roll filled with skagen mix (B. 195). 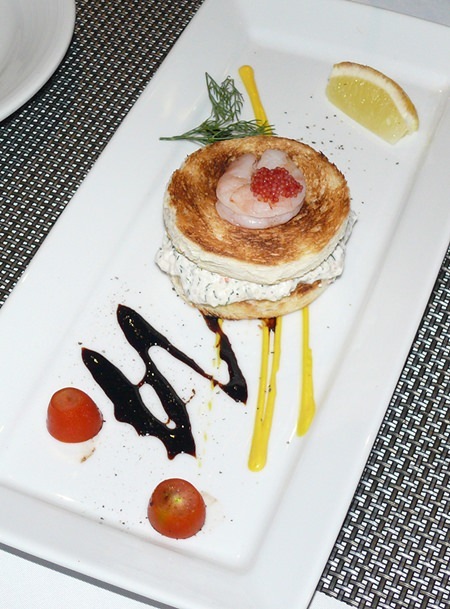 Skagen, is a prawn dish, with Toast Skagen which has Prawns in dill mayonnaise served on toast topped with lumpfish roe (B. 195). Still on the seafood, there is a Marinated Pepper/Lime Salmon served with toasted bread and dill mustard sauce (B. 325) followed by Cold Smoked Norwegian Salmon served with parmesan cheese, capers and topped with pressed olive oil (B. 345). After the salads, there are soups with French onion or Creamy Lobster Soup. The French onion soup Au gratin with cheese and bread served with toast (B. 205). Pastas include a Pasta Akvavit Tagliatelle with pork fillet and shrimps in a creamy sauce with a touch of sweet chili and curry (B. 385). Hamburgers are the Classic Hamburger (200 gm) Angus, served with dressing, coleslaw, aioli, tomato, onion, cucumber and French fries (B. 310). There are many dishes for the carnivores, starting with a Pork Chop served with a creamy sauce, pickled cucumbers and fried potatoes (B. 370). Vienna Schnitzel is served with red wine sauce and French fries (B.365), most others are under B, 400 including Schnitzel Scandinavia served with anchovies, capers, red wine sauce and French fries. When you get into the international grills, the prices naturally go up for imported meats. However, most are within B. 690 and that even covers the Chateaubriand for two. Hungry? Try the Pepper Steak 200 gm (Argentina) a grilled beef fillet with a green pepper sauce flavored with dark Jamaican rum, served with mixed stir fried vegetables and potato au gratin. Hickory Smoked Texas Spare Ribs, Beef Béarnaise 200 gm (Argentina). Chateau Briand Provencale (500 gm) (Argentina). Now here’s the top drawer items. Grilled Ribeye Steak 250 gm (New Zealand), Lamb Racks 200 gm (Australia), and Grilled Ribeye Steak 250 gm (New Zealand). You can see from the item prices in the menu that Akvavit Grill and Bar is not an expensive restaurant even though it has a ‘classy’ ambience and we were very happy with our choices for our meals. The dishes are properly cooked and the sauces and accompaniments were excellent, and the new house wines (Bandicoot Vineyards red and white from Australia) make for good quaffing. House wine is B. 175 per glass or B. 450 for a half liter carafe or B. 660 a bottle. Unless you are Scandinavian and grown up with these menu items, there are plenty of new choices for you to try, and for us, the Toast Skagen which has Prawns in dill was a great starter. From there we moved to the halibut, which was simply poached and delightful with fresh horseradish. We also tried the Pepper steak and the Rib eye. Both were cooked exactly to order and both were very tender and enjoyable. We finished with a lovely tiramisu. You don’t have to come from Norway to enjoy Akvavit (liqueur and restaurant). The presentation and quality and quantity is excellent. Definitely worth a visit and try the Toast Skagen. Akvavit bar and grill, corner Jomtien Beach Road, Cnr Soi 3 (careful, they have renumbered some of the soi’s on Beach Road). Open seven days, 9 a.m. to midnight. Plenty of on-street parking, phone 038-233672.